Even if it’s too cold outside, a quick stroll down the hallway can give you the burst of energy you need to get through the day. Researchers have found that sometimes laughter truly is the best medicine. According to Psychology Today, laughing releases endorphins, or feel-good chemicals in our brain. It can be easy to fall into the trap of overthinking and the best thing to do is refocus your brain on reading and turning the page. Studies show that sharing with someone can improve your overall mood. Surprise a loved one with tickets to their favorite sports game or an assortment of delicious gourmet cookies. 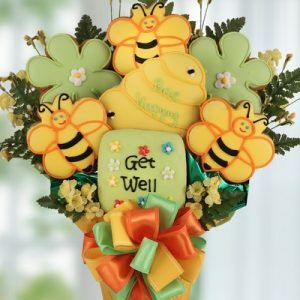 Bisket Baskets offers gifts like the get well cookie bouquet that are buzzing with handcrafted gourmet cookies. Don’t let the cold weather get you down by following our tips for getting through the winter blues. And when you’re looking to cheer someone up throughout the year, check out our many gift baskets and bouquets. Shop online today to personalize your own gift basket, cookie bouquet, or other gift package at BisketBaskets.com.